On hot days like these, a great escape from the weather is a thrilling trip to the movies. Kicking back in the air conditioning and getting lost in a film is one of life’s simple pleasures. Going to see a movie is also an excellent excuse to mindlessly munch on your favorite snacks! Popcorn is one of the first things you think of when imagining a movie theater. It’s the old staple, crunching on buttery deliciousness while you wait for the film to begin. But did you know that popcorn used to be banned in movie theaters? Back in the day of silent films, movie theaters were trying to replicate the feeling of real theaters. They had lush, lavish decorations and beautiful carpeting – which they absolutely did not want ruined by crunchy little popcorns. This experience was meant to be a luxury, and before the age of “talkies”, hearing your neighbor chow down wasn’t what you were paying big bucks for. Once sound was invented and you no longer had to be literate to understand the story, films became much more of a universal affair. Movie theaters had a much larger range of visitors, and it soon became commonplace for the local popcorn carts to set up shop outside of the busy movie houses. People were bringing so much popcorn into the theaters that some places made you check your popcorn bags with your coat! Some theaters saw the advantage of selling popcorn in their lobbies, and soon it became very obvious that the theaters that sold the salty snack were making profits through the roof! One chain tried to keep a few of its theaters “high end” by refusing to sell popcorn, but saw their profits fall into the red as the rest of the corn-friendly theaters continued to do well. It soon became a no-brainer for all theaters to include concessions, and now we even have theaters that provide a full meal and drinks while you enjoy your flick. Talk about luxurious! 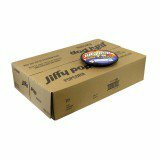 You can have the movie theater experience in the comfort of your own home by picking up some Jiffy Pop from our online store! It comes pre seasoned and ready to be popped!